This section will keep you up to date with the latest happenings in the world of East Anglian orienteering. Next March, we are planning to provide on one-day courses for Level C and Level B controllers respectively. The Level C course, to be held on Saturday 9th March, will give attendees the qualification needed to apply to BO to be a recognised Level C controller (You will also need to have requisite experience of planning and organising Level C events to become a controller). The Level B course, to be held on Saturday 30th March, is intended for Level C controllers to allow them to become Level B controllers. These courses will both be run by Michael Chopping of NOR and Keith Downing of SMOC. Both courses are open to attendees from other regions subject to places being available. At the time of posting, places are available on both courses. If you are interested in attending and have not already contacted us, please let us know by contacting your EAOA rep or anyone on the committee. On Saturday 2nd March and Saturday 9th March there will be a Level 2 Course (with a further assessment day on 23rd March) for those of you who would like to gain the qualification in Coaching Orienteering. The course will take place at Wandlebury Country Park near Cambridge. The cost of the course will be �0 to �0 depending on the number of participants. The EAOA and your clubs may be able to support this providing you are willing to undertake coaching for the region's juniors. If you wish to participate in the course, please contact Caroline Louth at equipment@waoc.org.uk and she will send you further details and a registration form. Initial expressions of interest by 15th December please with firm commitments by 2nd January - British Orienteering have a long lead-time to order resource packs for the course. Again, there may be spaces available for candidates from outside the region. Following the EAOA 2017 AGM held on held on 9th July, here are the draft Minutes, the amended Constitution and the Chair's report. Congratulations go to Andrew Elliott of SUFFOC who was presented with the Bill Stevens Trophy. 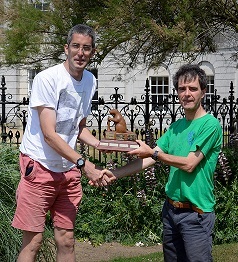 This trophy is awarded annually to someone who has contributed greatly to orienteering in East Anglia, often by working in the background, & Andrew has been the EAOA treasurer for some time. The minutes are now online. The Chairman Paul Beckett has agreed to remain as Chair for a further year. From Barbara Beckett, BSOC 2015 Organiser ... A HUGE thank you to all the EAOA members (including a special thanks to the EA Junior Squad) who helped to make this weekend a success. I did try to speak to you all individually at some point over the weekend, but I know that I missed seeing some of you, so please accept this as a personal "thank you". Also, Paul Beckett, Chair of EAOA, joins with me in thanking you on behalf of the EAOA Committee. Without the help of "an army" of volunteers these national orienteering events, which encourage young people to enjoy taking part in sport and enable them to meet competitors from all over the country, would not take place. My Inbox is already filling up with emails; the following are just a few: "Thank you, it was a great day out. Fun courses and a lovely setting." ... "Just a quick thanks to you and your army of helpers for your efforts over the weekend.... and as organiser thanks for the dry weather. Other than getting the controls in the right place its the bit everyone remembers most!" ... "It was lovely to have properly planned courses in such a lovely area."